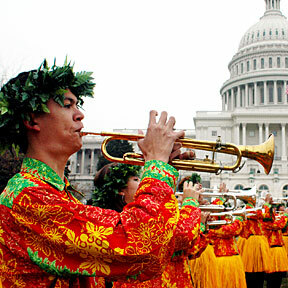 The Hawaii All-State Marching Band performed yesterday in Washington, D.C., on its way to New York for the annual Macy's Thanksgiving Parade. His father refused to give him money for "ice," the suspect's brother told police. Members of the local Society of Young Magicians increase poise and self-confidence. Forward Adam Morrison's 25 points and nine rebounds lead Gonzaga past No. 23 Maryland. Owner Fred Livingston is getting out of the restaurant business. While a Hawaii shelter for the homeless faces difficulty, the state has received a poor ranking in generosity to charities.